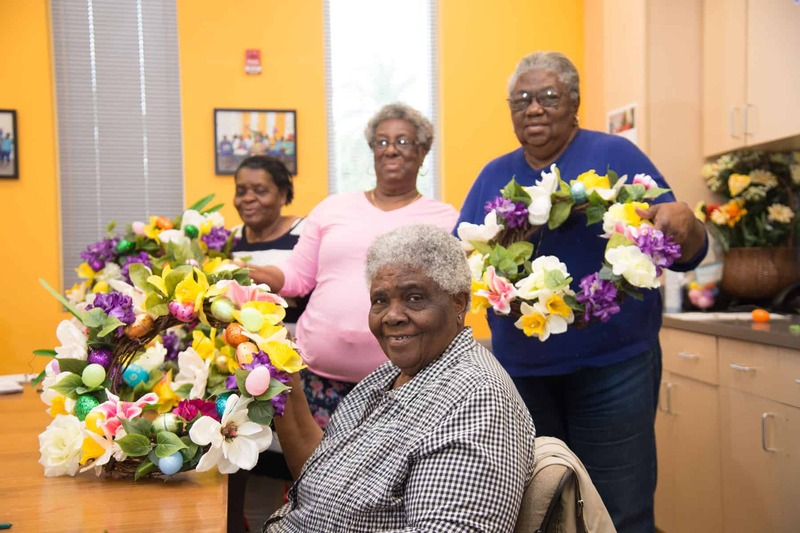 Ladies at the Heights Center in the Harlem Heights neighborhood of Fort Myers gather daily for art projects, a hot meal and plenty of good laughs among friends, courtesy of a partnership with the Lee County Friendship Centers. Our Lee County services are focused on nutritious meals and social engagement, supportive aging, health and wellness, an Adult Day option and an extensive volunteer program. It is a true lifeline for seniors in need of vital services in Southwest Florida. Check out Services for details about all of our programs. Lee County offers a licensed day program featuring supervised, engaging activities for seniors with cognitive or medical issues. Located in Fort Myers, our lovely facility is an inviting place to socialize with others, sharpen cognitive skills, reduce frustration, enjoy healthy meals, and feel valued. We also provide useful information for caregivers. Find out more at Caregiving. If you are having difficulty managing in your home, we may be able to help. Our case managers assess your needs, arrange for in-home services, conduct follow-up visits and monitor ongoing care. To access these services, call the Elder Helpline at 866.413.5337 or our office at 239.275.1881. Find out more at Resources for Aging. Enjoy a meal in a friendly social setting for the 60+ crowd at our 10 dining sites in Fort Myers, North Fort Myers, Cape Coral and Lehigh Acres. In addition to a nutritious lunch, you can participate in activities to strengthen your mind and body – and it’s a great way to connect with others. We can also arrange for the delivery of meals to isolated seniors through our Home Delivered Meals program, and we deliver Friendship Food Bags monthly to low-income elders. Find out more at Nutrition & Dining. Retired volunteer health care professionals are at the core of this unique model – staying connected to their love of medicine and helping low income elders receive medical care. In addition to monitoring chronic illnesses, we provide preventative care, including breast and cervical cancer screening. Two locations are by appointment only. Find out more at Health Clinics. We are the local sponsor in Lee County for the national Retired and Senior Volunteer Program (RSVP). Our office offers “one stop shopping” for volunteers 55+ interested in assisting non-profit, community and governmental agencies in improving our community. Opportunities focus on important issues such as seniors living independently, food and hunger. We refer to 16 partnering agencies as well as our own Friendship at Home (friendly visitor) program and RELIEF, a respite service for caregivers. For details about volunteering in Lee County, call 239.236.8682 or visit Volunteering.